1. A space or equipment necessary for doing something: The sports facility in Monica's town is quite good because it includes an indoor swimming pool, a sauna, and tennis courts. 2. An establishment set up to fulfill a particular function or to provide a particular service: Normally medical facilities are available in most places so people can go there to see a doctor about their illnesses or injuries. 3. The capability to do or to learn something very skilfully and easily; a natural talent or gift: After practicing the piano for just a week, Mildred showed her facility of playing a variety of musical performances for her teacher and classmates. © ALL rights are reserved. 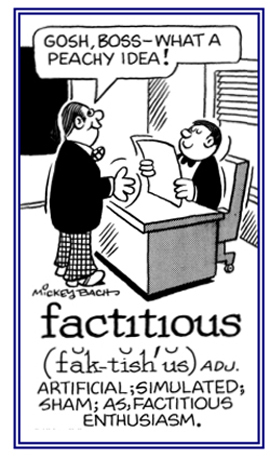 Characterized by wanton disregard of facts. 1. A group of people who express shared beliefs or opinions that are different from others who are not part of the organization: The liberal faction of the political party in Sam's town got together to discuss their propositions before getting together with the other politicians. 2. A number of persons who are formed to seek some objective within a political party or a government: A faction suggests some quarrelsome dissent from the objectives pursued by those who are part of a majority of officials. 3. A literary work or film that is a mixture of fact and fiction: Some novels present history as a faction so the reader is always fascinated by the events that took place at some other time. 4. 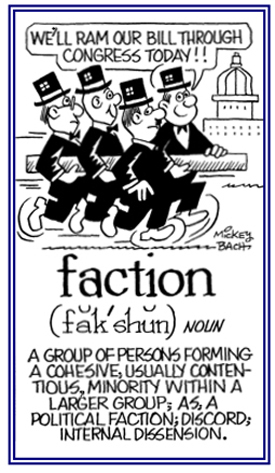 Etymology: from Latin factionem, "political party, class of people"; literally, "a making or doing", from facere, "to do". © ALL rights are reserved. Relating to dissension, disharmony, or to conflicts: In some countries there are factious political groups who strive to overthrow their government or who want to separate from their country and be self-governing. © ALL rights are reserved. 1. 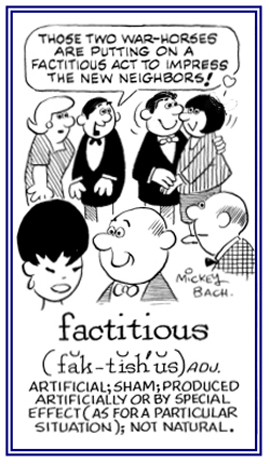 Pertaining to a contrived and insincere rather than genuine attitude or behavior: Becky gave her friend’s mother a factitious compliment about the lunch she had prepared, although Becky didn’t like it at all! 2. A reference to something that is being communicated in jest or as a joke: Max was being a factitious person when he suggested that he and his friends stay up all night to celebrate his birthday. 3. Lacking authenticity or genuineness; a sham: There are those who are convinced that the idea, or plan, by the President about taxes is a factitious proposal. 4. 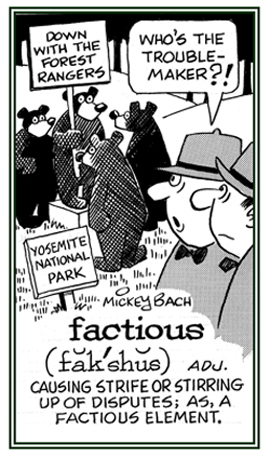 Etymology: from Latin factitius, "artificial"; from factus, past participle of facere, "to do". © ALL rights are reserved. Showing page 12 out of 42 pages of 624 main-word entries or main-word-entry groups.